When we as a family prepare to go on a vacation there are usually two types of people in our family. Type One – the under-packer who just wants to be out the door and in the van in fifteen minutes or less and worry about what we didn’t bring with us later. 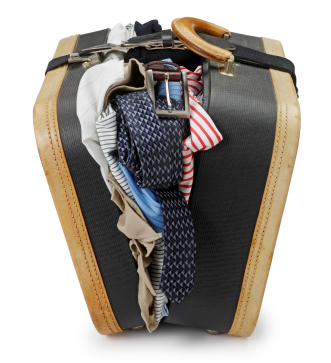 Type Two – The over-packer who wants to bring everything from our home along with us on the trip and takes twice as long to get ready to leave. Also this type two person (who will not be named but I’m married to her) has to clean the house as if we were receiving an inspection from a military grade house inspector with white gloves and all. If you haven’t guessed yet, I’m the type one person who at times sits impatiently in the van honking the horn as the type-two person (again unnamed but I’m married to her) finishes cleaning the house until it shines and is sparkling clean. Truth be told, I am glad that my wife takes great care in our preparations and in the long run, as much as I hate to admit it, She is right. Sin can weigh us down. Make no mistake about it, the old life (before Christ) leads to death. When we come to Jesus and we accept His gift of salvation we are made into new creations by His blood. The old has gone and the new has come (2 Corinthians 5:17)…but at times we still feel as if we have to keep lugging that baggage around with us. It weighs us down, causes us difficulty and trouble and yet we still habitually burden ourselves with this unnecessary baggage. When Christ saved us, He did so completely yet we find it very difficult to let go of old habits and old sinful ways of living. The Holy Spirit prompts us to unclinch our white knuckled fists which are tightly holding onto these things that we needn’t any more to grasp. In times of trial and stress, these old remnants also rear their ugly heads to cause us strife and further temptation as well. When we lose our focus on the forward prize of Holiness, which is the image of Christ alive in us, we face the old self again. When this happens a flood of the old tendencies pours in and once again we find ourselves taking two or three steps backwards in our progress of Holiness. This baggage has been there all along festering and molding in a cold dark corner of our hearts and we’ve been reluctant, even rebellious in our lack of spiritual attempts to deal with it, so, instead we ignore it. The Holy Spirit knows that this baggage does not belong in our new creation. He is spurring us, even painfully at times, to let go of it. Why do we still clutch it ever so tightly? What good can ever come from its hold on us? This baggage stands blatantly in our path of real, tangible Spiritual growth and yet we allow it to stunt us. 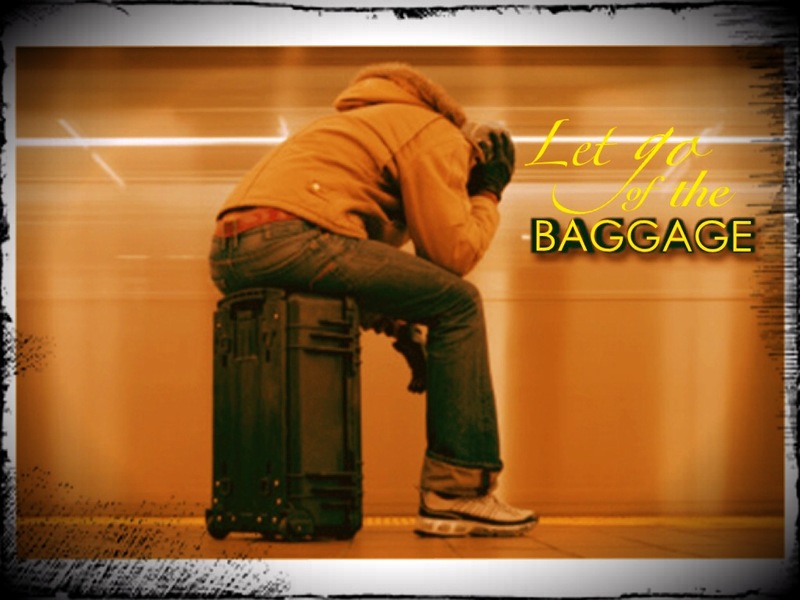 Prayer – Dear Lord, allow me to see this baggage in my life today. Show me that which still blocks my steps to full surrender. Reveal to me the places that I have yet to let go of. I do not want these burdens of the old creation to hinder my forward progress of reflecting You. -Amen. 2) The Baggage can also be our guilt, shame and self-worth. The old life also has a way of convincing us that we are not good enough to be like Christ. It will try and convince us that we will never be good enough or smart enough to receive such a reward from God. This has nothing to do with pride, in fact just the opposite. When Christ redeems us, the wretched sinner, He does so completely. When we commit our hearts to Him, He washes us clean. This doesn’t mean that we won’t face temptation again or that we can not fall, but it does mean that His blood sacrifice can and will cover up our sinful old creations and wash them away. Our part, within this free will, however, is that we must confront our old harmful choices that we have made. This is the consequences of sin, we have to face it. Sometimes in facing it we find ourselves so wrecked by it that we begin to doubt if Christ could truly love us because we have done so much wrong. This remnant of the old baggage clings to us and tries to convince us of the lie that we are not worth His time and that, perhaps, we were never salvageable through His gift of salvation. Don’t buy the life. This isn’t about pride, but it’s about truth. You matter to God! He loves YOU! He wants to remind you that you are His precious child and that you are a son or daughter of the Most High! Don’t cling to this old baggage, which is a lie. Let go of it, and embrace this truth of His saving grace – You are His and He would do it all over again if you had been the only human alive! When you let go of this old baggage and recognize how much it has weighed you down you will begin to see how free you will feel. Let go, and find this burden lifted from you! Prayer – Dear Lord, remind me again of how much you love me. Remind me when I struggle with my identity in You that I am worthy because of Your love. Help to me see myself as You see me, and as I do help me to let go of my grip on this baggage of self-worth. Thank you for your love and for your hand upon my life, lift me up out of this pit of self-degradation and give me a passion to serve and love you with ever fiber of my being. -Amen. Letting go of the baggage that hinder us is only the first step, now we have to press on. Jesus is our living example, and this world still needs His example lived out in Holy Christ-following people. Shine so that others might see Him. Live as the Holy Spirit leads you to live. Get up and get on with this new creation…oh and leave your baggage behind! And He can do what no other power can do. Previous Post Previous post:Either Put Up or Shut Up! I’m All in or nothing at all!